Pancreas is a relatively difficult organ to display. We distinguish three parts of this gland - the head (caput), the body (corpus) and the tail (cauda). We examine it in a transversal "cut" through epigastrium. 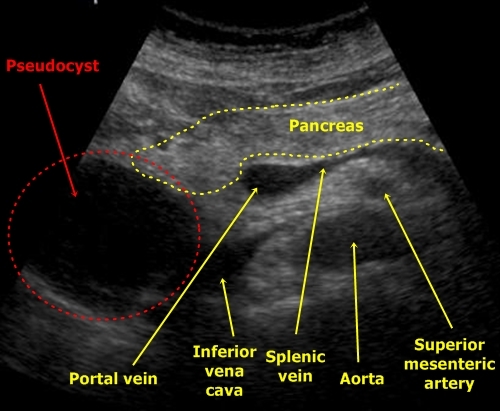 Behind the pancreatic tissue there runs splenic (lienal) vein out of the spleen towards the liver. 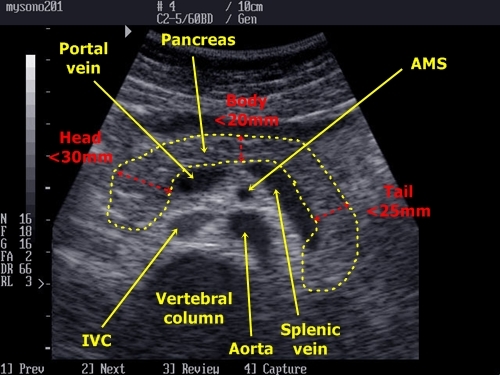 Near the head of the pancreas splenic vein flows into the portal vein. Unfortunately between the probe and the pancreas there is located transversal colon. When intestinal air is present inside the colon it creates hypoechogenic shadows which could cover pancreas entirely. 1. Maintain stronger pressure with the probe - The pressure could evacuate the intestinal air and so make pancreas more visible. (We can also ask patient to push by his abdomen against the probe). 2. Examine patient when standing - There is a chance that when standing the colon falls by gravity down to the lower parts of abdomen "freeing" the pancreas. 3. Try to put the probe to position when the signal runs through liver parenchyma. Liver parenchyma is a good signal conductor and makes pancreas also more visible. 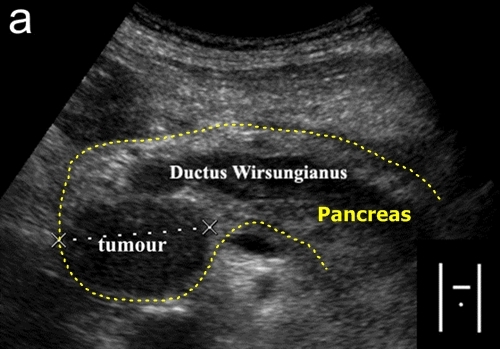 Pancreatic tail is better seen by a special maneuver - put the probe classically into trasverse epigastrical projection, display the pancreas and then rotate the probe counterclockwise a bit (approximately 45 degrees). Lipomatous pancreas – Pancreas of a young adult is hypoechogenic (similar to liver parenchyma). With higher age there grow deposits of fat inside the pancreatic tissue and the gland becomes hyperechogenic (brighter). This normal finding is diagnosed as lipomatous pancreas. Lipomatous pancreas - Pancreatic tissue brightness is much higher than the liver one. 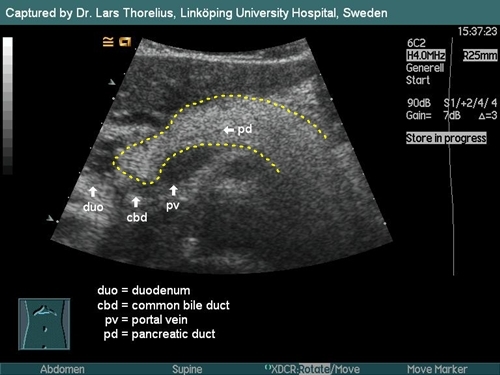 Acute pancreatitis – The tissue becomes swollen, more hypoechogenic (darker) and worse bordered from nearby tissues. We often find fluid in the surrounding areas. 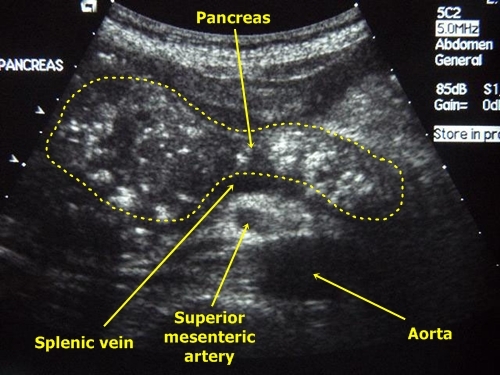 Ultrasonography is, however, not very reliable in diagnosis of acute pancreatitis. Acute pancreatitis - Pancreatic gland (P) is edematous and there is a fluid visible in front of the pancreas. (Black anechogenic strip marked by arrows). 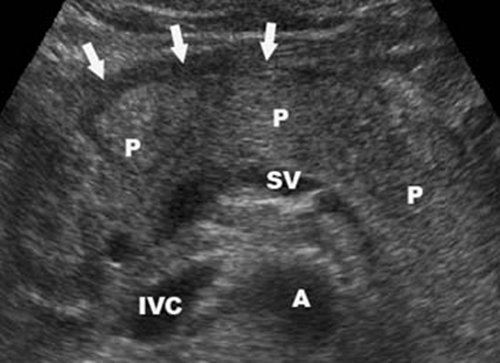 From other anatomical structures we see splenic vein (SV), aorta (A) and inferior vena cava (IVC). 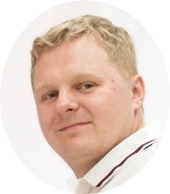 Chronic pancreatitis – There are several important marks. Pancreatic duct is moniliformly dilated, pancreatic tissue becomes granular, fibrosis appears as dotted hyperechogenic areas. There are often calcifications present and eventually a cystoid could be seen (typically near pancreatic head). The margins of the pancreas become rough. Pancreatic pseudocyst – It is common as a post-inflammatory complication. It is mainly regular round anechogenic structure. Pseudo-cyst - Big round object in a narrow contact with pancreatic head. A tumour could be similar, but it would not be probably so anechogenic. Pancreatic tumor – It is a hypoechogenic irregular mass often very badly differentiable from nearby intestines or lymphatic nodes. The can also be easily mistaken with a pseudocyst. Pancreatic tumor - Pancreatic head is enlarged by a hypoechogenic mass. The tumor probably also blocks the pancreatic duct, which seems to be dilated.